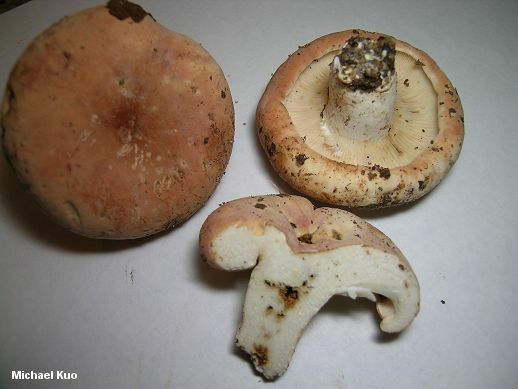 With its pinkish brown colors and stocky stature, this mushroom is somewhat reminiscent of Russula compacta--but you're not likely to confuse the two on closer inspection, since Lactarius allardii exudes copious milk when sliced. The milk is white, but turns slowly green and eventually brown on exposure. The cap lacks concentric zones of color, and its surface is dry and usually has a finely velvety feel (use your fingertip). Other distinguishing features include the acrid taste and distinctive microscopic features (see below). 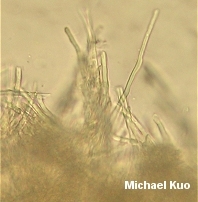 Ecology: Mycorrhizal with oaks in hardwood forests or in pine-oak forests; growing scattered or gregariously; summer and fall; distributed from Michigan to Texas and Georgia, but more common in the southern part of its range. Cap: 4-20 cm; convex with a shallow central depression, becoming shallowly to deeply vase-shaped; dry; smooth; finely velvety to the touch, at least when young; whitish when very young or when covered with leaves, but soon becoming brownish pink to pinkish brown, and eventually darkening to brick red. 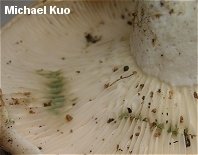 Gills: Attached to the stem or beginning to run down it; close or nearly distant; whitish, maturing to buff; staining greenish, then brown where damaged. 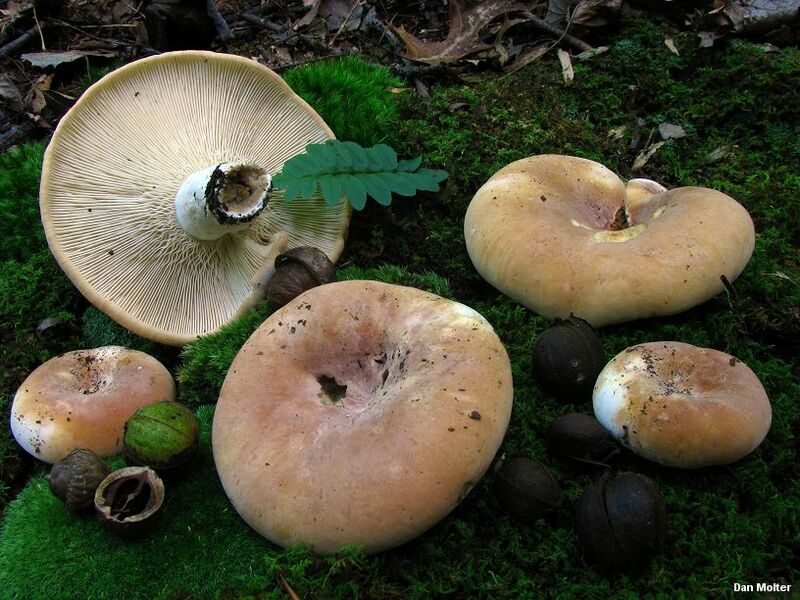 Stem: 2-7 cm long; 1-3 cm thick; more or less equal; hard; bald; without potholes; white, or becoming colored like the cap; hollowing; dry. Flesh: White; staining purplish pink, then greenish when sliced. Milk: White, turning slowly greenish, then brownish; copious; sticky; staining tissues greenish, then brownish; staining white paper yellow. Odor and Taste: Odor fragrant, or not distinctive; taste strongly acrid. Spore Print: White to pale yellowish. 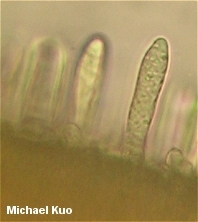 Microscopic Features: Spores 7.5-10.5 x 5.5-8 µ; subglobose to broadly ellipsoid; ornamentation well under 0.5 µ high, as isolated warts and rare, scattered connectors. Pleuromacrocystidia abundant; subcylindric to subfusoid; to about 130 x 15 µ. Cheilocystidia similar but shorter. Pileipellis a cutis-like tangle of cylindric elements that are often aggregated into upright fascicles of pileocystidia up to 100 µ long and 5 µ wide. REFERENCES: Coker, 1918. (Hesler & Smith, 1979; Smith, Smith & Weber, 1979; Weber & Smith, 1985; Phillips, 1991/2005; Metzler & Metzler, 1992.) Herb. Kuo 09029502, 10170911.